More antioxidants than any other nut. Can help reduce the risk of heart disease and lower cholesterol levels. Contain more than nineteen (19) vitamins and minerals. Are a natural, high-quality source of protein and naturally sodium-free. The pecan nut, which is the only nut indigenous to North America, was a favored nut by Native American Indians. The Algonquin tribe named the favored nut “pecan” because the word means “all nuts requiring a stone to crack.” Pecans were preferred due to easy accessibility via waterways and their easy preparation. 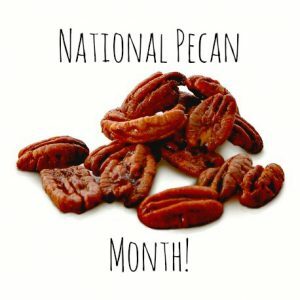 Originating in North America and parts of Mexico, Native American tribes enjoyed over 1,000 varieties of pecans. The wonders of pecans are boundless. With a little ingenuity, you can make salads, snacks, and sweets or just eat them straight from the bag. Bring it! Tried and true recipes for potlucks and casual entertaining by Ali Rosen. TX715.R8339 2018. Recipe for Kale salad with carrot ginger dressing (with 1 cup pecans) on pg. 70 and Caramel pie bars on pg. 214. Dewey or Don’t We? Librarians Cook by Susan Henricks. TX719 D49 2004 Recipe for Pecan muffins on pg. 137 and Pecan tarts on pg. 223. The New York Times Large Type Cookbook TX715 N544 1985 Recipe for Pecan raisin whirls on pg. 344.